Hey Everyone! Let's Rock n Roll in the new Cocoa Village studio! Wanna have some fun?! Look no further & come take a class with me, the one and only, Rocky. If I could chill with the fam, play volleyball, eat burritos, and paint simultaneously life would be even more perfect. I'm a born & raised Floridian and am overjoyed to share my love and talent to guide you through an extraordinary FUN art experience! 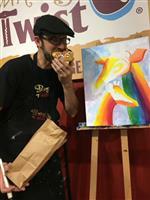 My usual subjects range from furry animals to beachy scenes, and everything in between. I am a mother to two rambunctious, curious & melt-your-heart adorable little boys! Painting is so much more to me than just putting bright colors to a canvas; it is a great way to relieve stress, and let out all of your emotions. 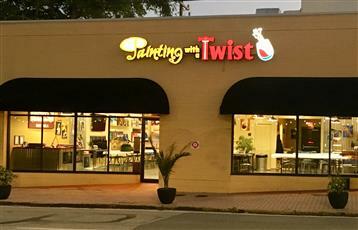 Whether you are an experienced painter, or have never picked up a paint brush, I will make sure that the moment you walk into the room that you feel at home and leave feeling proud about your new masterpiece that was created from your hands! Here's a FUN FACT: I have 24 furry paws in my home, which includes three dogs and three cats!" I'm a simple Mississippi girl, who's been fortunate enough to view art at the Louvre in Paris, as well as at museums, churches, and palaces in Versailles, France; Florence and Rome, Italy; and London, England. 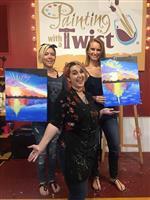 But the most fun I have ever had with art is at Painting with a Twist! If you are nervous about your ability as a painter, don’t be! 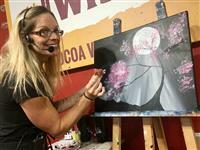 Come & paint with us! We'll guide you step by step. What do you have to lose? It’s only paint! FUN FACT: I didn’t know I could even draw until I was in 10th grade biology and my teacher made me draw diagrams of tape worms and cells! There are so many beautiful reasons to be Happy! I love to dance the Macarena, sing off key & make folks LAUGH! When not in the studio, I'm Mom to 4 incredible kiddaroos who I've taught to address me as 'gorgeous mommy' when in public. I think being a School Bus Driver would be the second coolest job ever! 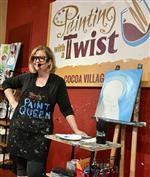 The best is what I get to do every day in the PWAT Cocoa Village Studio! Every day FUN! Now, keep calm and let's pARTy on! 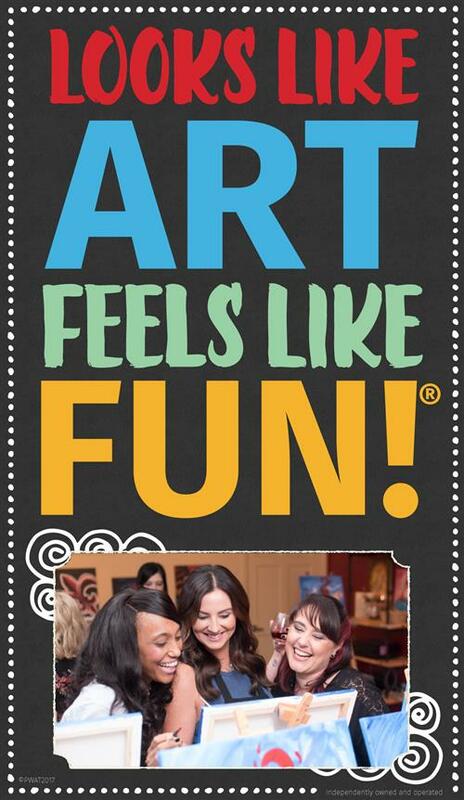 A little face painting, a little balloon twisting and a whole lot of fun! 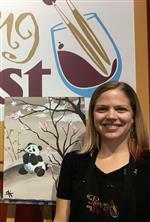 As long time owner of Must Love Kids, Liz is always on the lookout for whatever fuels her creative & artsy side. Whether its a children's party, company picnic, summer camp, church festival or corporate event, Liz facilitates FUN for every age group! 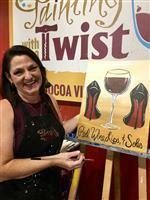 As a Painting with a Twist Artist Instructor, Liz believes she has hit her creative jackpot! Ready to have a good time? Book a class with Liz now! If you can handle a little silliness, a little sarcasm and a whole lot of laughter, then I'm sure we'll have a good time! I'm a gal who loves to go, go go; leading Zumba classes, churning out batches of homemade soap, and baking over-the-top decadent desserts! Teaching & creating, what more could you ask for?! I have a passion for learning new things and I'm thrilled that I can help others explore their own untapped inner artist -trust me, you'll surprise yourself! We're gonna create some beautiful paintings! FUN FACT: In her private life, Sarah is an undercover superhero, saving the day from the brink of utter ruin several times an hour for her young daughters.